A radiant eye liner that also doubles as an eyeshadow, this is the most voluptuous pencil yet! NYX Professional Makeup creamy Jumbo Eye Pencil glides on effortlessly - no pulling tugging or fading - and come in a rainbow of vivid hues. NYX Jumbo Eye Pencils can be sharpened with a sharpener that has an opening for a large pencil. Creamy eye liner that also doubles as an eyeshadow. Made with a blend of mineral oil and powder. No pulling tugging or fading. Explore the entire range of Eyeliner available on Nykaa. 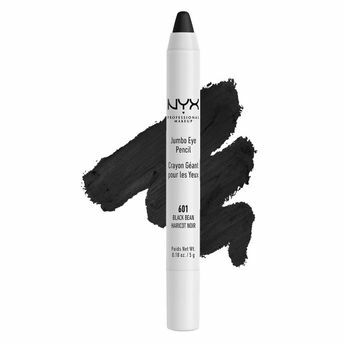 Shop more NYX Professional Makeup products here.You can browse through the complete world of NYX Professional Makeup Eyeliner .Alternatively, you can also find many more products from the NYX Professional Makeup Jumbo Eye Pencil range.